The International Fuel Tax Agreement (IFTA) is an agreement among states and Canadian provinces to simplify the reporting of fuel use taxes by interstate motor carriers. In California, IFTA is administered by the Motor Carrier Section of the Board of Equalization. 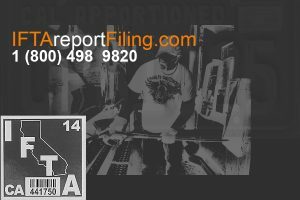 IFTA Report Filing Staff are experts at California CA IFTA process, prevention of audits and making sure you are in compliance with all rules and regulations. • Diesel-powered vehicles used in interstate commerce, this is generally all owner operator and fleet owned commercial trucks. • Vehicles powered by liquefied petroleum gas (LPG), liquefied natural gas (LNG), compressed natural gas (CNG), or certain alcohol fuels. This sometimes pertains to owner operator and fleet owned commercial trucks. If you operate the above vehicles on a public highway in California without a required permit or license, you are subject to fines and penalties, and your vehicle could be impounded. • When used in combination (for example, a tractor-trailer combination), has a combined weight exceeding 26,000 pounds or 11,797 kilograms gross vehicle weight. You do not need a fuel permit or license to operate a diesel-powered vehicle driven solely in California. Likewise, you do not need a fuel permit or license for a diesel-powered recreational vehicle, such as a motor home or a pickup truck with a camper, if the vehicle is not used in connection with a business operation. See reverse side of this publication for more information on each permit and license. In general, you must have a fuel permit or license to operate a vehicle on public roads in California if the vehicle is powered by liquefied petroleum gas (LPG), liquefied natural gas (LNG), compressed natural gas (CNG), or certain alcohol fuels. Please note: You must pay use fuel tax to your vendor when you purchase fuel for the exempt vehicles previously listed. If you do not, you must have a fuel permit or license to operate the vehicle on a public road in this state. • IFTA License Please note: To qualify for an IFTA License, your vehicle must be used in interstate commerce and meet the weight requirements previously listed for diesel-powered vehicles.